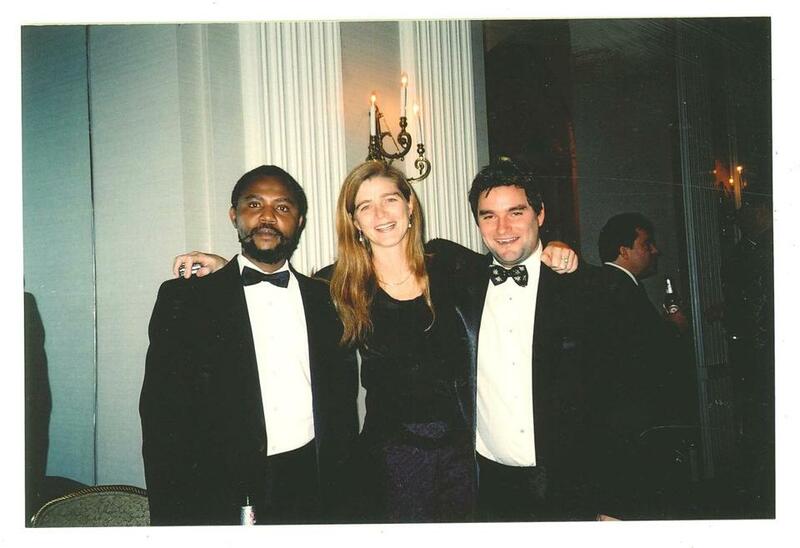 Alexis Sinduhije (left), Samantha Power (middle), and Bryan Rich (right) at the Committee to Protect Journalist awards in 2004. The thin, bird-like man in a worn gray suit meets me in the lobby of the Hilton hotel. His 9-year-old daughter and 4-year-old son cling to his legs. They’re refugees from Burundi, on the run since an attempted coup rocked the country in May. He was a TV anchorman, unlucky enough to work the day of the coup. He reported the news live on television. After the coup failed, pro-government militiamen attacked his house and threatened his life. He glances around nervously. For lunch, he chooses a table hidden behind a wall of ferns. He believes that even here, in another country, the long, vindictive arm of Burundian intelligence agents could still track him down. He tells me the story of his escape from Burundi, through Rwanda, Uganda, and finally Kenya. He took two of his kids — the ones sitting with us now, munching french fries. His wife, nine months pregnant, stayed behind to have the baby. Then she, too, fled with their newborn son and two other children. He hasn’t heard from her in four months. Some say she’s in a refugee camp in Rwanda. Others say Tanzania. “In Burundi, if your husband is wanted, or some member of your family is wanted, everybody is in danger,” he explains. This journalist, who asked that his name be withheld, is one of 242,000 Burundians who’ve fled their country over the past year, an exodus that’s virtually invisible in a world preoccupied with Syrian refugees. As aid agencies stretch to the breaking point, he’s not sure how to make ends meet. The soonest the UNHCR could grant him an interview: February, 2017. But Burundi — a tiny, land-locked country in Africa — has something other than refugees in common with Syria: It’s a place where peaceful pro-democracy protests have morphed into armed rebellion. In recent years, and especially since the coup, journalists, human rights activists, and political opposition figures have been arrested, tortured, and murdered. The world did not rescue them. So some chose to take up arms and fight. Now the UN Security Council is paying attention. It warns that Burundi is on the brink of another civil war. But, to people like my lunch guest, that war has already begun. He scrolls through social media feeds on his phone that feature photos of the dead. “This is my cousin,” he says. On the screen, a young man stares blankly at the camera, a trail of what looks like blood visible on his shirt. The photo was taken at a police station, just before his execution. A police officer’s boot can been seen in a corner. “He was an artist,” the journalist tells me. He brings up another photo, of the young man in a studio, sculpting a clay head. I take one more look at the photo of the doomed man, who must have known he was about to die. “What crime did they suspect him of?” I ask. Imet Alexis Sinduhije in the late 1990s. An aura of specialness surrounded him even then. He was a Burundian reporter — one of the few who had the courage to speak the truth. He worked at a radio station started by Search for Common Ground, a nonprofit organization that promotes peaceful coexistence. Alexis was famous for getting Hutus who’d killed Tutsis and Tutsis who’d killed Hutus to confess their crimes on air — and express remorse. When I met him, Burundi was deep in the throes of an earlier civil war. The Tutsi minority, who had run the country for centuries, didn’t want to give up power to Hutus, who made up 85 percent of the population. In 1972, the Tutsi-led military slaughtered Hutus, especially those who could read. Decades later, Hutu rebels took revenge by systematically murdering Tutsi peasants. After similar ethnic tensions sparked a genocide in neighboring Rwanda, the United Nations decided to intervene in Burundi. Politicians from Burundi of every stripe descended like locusts on the town of Arusha, Tanzania, for UN-sponsored talks. They sipped UN-sponsored wine in UN-sponsored hotel lobbies, while their fighters blew each other’s brains out back home. Foreign journalists like me, who were trying to make sense of the conflict, took Alexis out for drinks. He was an exceedingly rare thing in Burundi: a Tutsi who spoke up for the rights of Hutu. In a country where ethnic identity could mean the difference between life and death, the only tribe to which he displayed allegiance was journalism. Over the years, he became an international symbol of how the media can promote peaceful democratic change. He won a Shorenstein Fellowship to Harvard, where he became friends with Samantha Power, who ran the Carr Center for Human Rights Policy at the Kennedy School. (Today, she’s the US ambassador to the United Nations.) Power helped him get funding from the Soros Foundation to start his own radio station in Burundi, Radio Publique Africaine. She served on its board. “As a result of his fearlessness as a reporter and the exposure he got at Harvard, he built a powerful network that included people like Joe Nye, Bill Moyers, and Charlie Rose and others,” said Bryan Rich, who worked at Search for Common Ground in the late 1990s, and later made an independent documentary film with Alexis that interviewed youth who killed civilians on both sides of the conflict. Alexis received a prestigious award from the Committee to Protect Journalists. He appeared on “Nightline.” Time Magazine named him one of the 100 most influential people in the world. “Sinduhije has been linked to plans to assassinate senior Burundian officials and has continued to actively plan attacks on government targets,” read the announcement from the Office of Foreign Asset Control, the same agency that sanctioned Osama bin Laden. Sanctioned individuals can’t do business with Americans or access money in US bank accounts. My first thought was: The US government is making a really embarrassing mistake. Then I thought: They must be talking about a different man. This can’t be our Alexis. But as I learned more, I began to entertain the possibility that it might be true. I asked the Office of Foreign Asset Control for more information, but the agency doesn’t release the evidence behind its sanctions. Which is why I’m sitting here at the Hilton in Nairobi, treating Burundian refugees to lunch. “Is it a crime to be a follower of Alexis?” I ask. He takes my notebook and writes the words: Red Tabara. I’ve never heard of Red Tabara before. What does it mean when an icon of peace begins to advocate for war? That he has lost his way? Turned to the dark side? Or simply discovered that democracy can’t be safeguarded without military force? We live in an age that holds up nonviolence as the linchpin of progressive values. We’ve been spoiled by the successes of the civil rights movement, Mahatma Gandhi, and Aung San Suu Kyi. We’ve forgotten the role that violence played in the American Revolution, the defeat of Hitler, the demise of apartheid. We’ve forgotten that for most of human history, it wasn’t enough to be morally right. To survive, one also had to be militarily superior. But two decades ago, armed resistance was the last thing on Alexis’s mind. He believed that journalism alone could save his country. For years, his radio station fought to expose that corruption. When the well-dressed corpse of a World Health Organization official turned up floating in a lake, he uncovered evidence of a corrupt scheme involving malaria medicine. He invited François Nyamoya, a lawyer whose sister had been wrongly accused of the killing, to talk about the case on air. Nyamoya traced the murder to Burundian intelligence officials. The story became so explosive that the government was forced to arrest the intelligence agents and set Nyamoya’s sister free. Alexis and Nyamoya became close friends. In 2005, they worked together on another big case. Nyamoya represented a former vice president who’d been accused of staging a coup against the new president, Pierre Nkurunziza, a Hutu and former rebel. The more they investigated, the more convinced they became that the coup was a fake, cooked up by Nkurunziza to neutralize his rivals. Once again, Alexis invited Nyamoya on the radio. Once again, Nyamoya’s client went free. But this time, the victory was accompanied by a grim realization: The new Hutu-led government was just as corrupt as the old Tutsi-led regime. A brave journalist and lawyer could expose that corruption. But they could not offer an alternative to it. That’s when they decided to form the Movement for Solidarity and Democracy, a new political party aimed at fighting for the rights of ordinary people, both Hutu and Tutsi. Nyamoya became the party spokesman. Alexis became the party’s candidate for president. He drew large crowds at his speeches. He promised to fix the economy and to invest in poor farmers. Most of all, he promised to end the manipulation of ethnic animosity for political gain. Still, they had high hopes of winning local elections in May of 2010. Yet MSD garnered just 3.75 percent of the vote. Maybe MSD wasn’t as popular as Alexis had thought. Or maybe the government had succeeded in intimidating voters. Whichever the case, Alexis grew convinced that Nkurunziza had committed massive fraud. MSD boycotted the presidential and parliamentary elections, along with 11 other opposition parties. Unopposed, Nkurunziza won in a landslide. After the boycott, Nkurunziza dismissed his opponents as crybabies who ran to the UN when they lost an election. He consolidated his power. Then he began to hunt his political enemies down. More than 250 opposition members were arrested. At least a dozen were tortured, according to Human Rights Watch. In 2011, men in police uniforms arrested Leandre Bukuru, a successful Hutu businessman and member of MSD. His body was discovered miles away from his severed head, which had been stuffed into a latrine. When Alexis heard that Bukuru had been beheaded, he called Samantha Power, who worked at the White House at the time. Although Power had authored a book, “A Problem from Hell,” which criticized the Clinton administration's failure to stop the genocide in Rwanda, she had no magic solution to offer Alexis. MSD leaders say they lost hundreds of people — perhaps even a thousand — over the next year in a government-sponsored campaign called “Safisha,” which means “to clean.” Human rights groups say that estimate sounds high. But investigating these allegations is dangerous, so no one knows for sure. In 2014, police surrounded MSD headquarters with guns drawn. Earlier in the day, a group of MSD members had jogged together through the capital. Police officers accused them of staging an illegal protest. In the melee that followed, two police officers were briefly taken hostage. Alexis escaped over the back wall and fled the country. And so, just as it had dawned on Alexis that journalism couldn’t save his country, he concluded that politics had also failed. This past year, Nkurunziza engineered a third term for himself, sidestepping the constitution. In May, a Hutu general who opposed the third term attempted a coup, but failed. Ever since, Nkurunziza has allowed his security services to hunt down journalists, human rights activists, opposition politicians, and peaceful protesters of his third term. In turn, youth loyal to opposition parties — including MSD — have armed themselves and attacked police. Nyamoya, the MSD spokesman, who spent seven months in prison on bogus charges, says there is no nonviolent way to rid Burundi of this regime. Yet, when I ask about Alexis, he responds like the lawyer that he is. “There’s no evidence that he is a rebel leader,” he says. I ask if Red Tabara is the MSD’s military wing. “Not true,” he says emphatically. But then he points to my tape recorder. “Even if it were true, I couldn’t tell you,” he laughs. Nonetheless, he agrees to meet. The question is where. Goma? Gisenyi? N’Djamena? Brussels? Burundi has put out an international arrest warrant for him, so he must be careful where he goes. In the end, we agree on Paris. It’s almost dinnertime. He arrives at my friend’s apartment in a brown fleece jacket and corduroy pants. His black backpack has a Red Bull logo on it. He could pass for a graduate student, but for the salt and pepper flecks in his hair and his beard. He doesn't look like the leader of an armed rebellion. I tell him so. He smiles. Nonetheless, in recent months, a string of mysterious assassinations have shaken the government of Burundi. Lieutenant General Adolphe Nshimirimana, the notorious former head of the intelligence service — who personally arrested Nyamoya — died when two rockets struck his car. Two days later, an unidentified assailant shot a local leader of the ruling party dead while he was riding his motorcycle. Alexis admits that he rejoiced when Nshimirimana died. “But I didn’t kill him,” he insists. He admits that he drank wine all night to celebrate the coup and felt “very disappointed when it failed.” But he insists he had no role in it. He insists, too, that his followers have no civilian blood on their hands. Yet, armed youth loyal to him conduct attacks that provoke security forces to fire on civilians. In December, a group of unidentified assailants attacked a series of military bases. Security forces retaliated by randomly shooting innocent bystanders in neighborhoods known for supporting the opposition. I ask if Red Tabara is his party’s military wing. “Let me explain,” he tells me. He says the group is led by an MSD member, a Hutu former law student who served a stint in prison in 2010. He says this young leader — later identified as Biremba Melchiade — wants to make space for the transitional government that Alexis is trying to establish in exile. But Alexis insists that he does not control the group. Yet, he does not deny that he supports Red Tabara morally. On my computer, I pull up a UN report which contains a purported photograph of Alexis leading rebels in the jungles of the Congo. We laugh about it, because the guy in the picture clearly isn’t Alexis. But the US government’s allegations are far more serious. I bring up the sanctions. At first, Alexis just shrugs. “I only had $1,000 in the United States,” he says. By the end of the night, it’s clear that the sanctions have stung him in a personal way. They’re a sign that the international system, which once feted him, has now turned its back. He says he hasn’t spoken to her in over a year. “Burundi is also a problem from hell,” he adds. Kurtis Cooper, a spokesman for Power, said that she had “employed a full range of diplomatic, political and economic tools” to try to dissuade Nkurunziza from cracking down on civil society and running for a third term. Power, who has visited Burundi three times as UN ambassador, is still pushing for an international presence to safeguard civilians in Burundi. Alexis was sanctioned — along with a Burundian official and a member of a pro-government militia — because of “violent, destabilizing activities,” Cooper said. My dinner with Alexis is almost over, and he has stopped talking about the sanctions or stolen elections or even his nemesis, Nkurunziza. What he is speaking about now, with great emotion, are all the people who have died. The woman with the 6-month-old baby. The 4-year-old boy, whose parents weren’t home. Charlotte Umugwaneza, an MSD activist and mother, whose body was dragged from the river. When so many people have been killed in your name, it raises the stakes to make sure they didn’t die in vain. I ask him if he ever misses being a journalist. He nods.